BucketVise™ is a new professional grade tool for solving some old problems. BucketVise is a large thermoplastic rubber ring with "wings" that allows the user to insert most 3.5 to 5 gallon plastic buckets in its center ring to significantly increase the stability of the bucket. 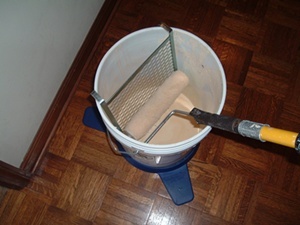 Then the contents of the bucket can be mixed, stirred or used without the bucket spinning or moving around on the floor or other surface and thereby reducing the possibility of injury, spillage and the loss of the contents.. Because of the pliable, soft, ruberized materials the BucketVise is made of, placing a bucket with a clean BucketVise on the bottom should prevent the bucket from scratching a finished surface ie, like finished hardwood floors, furniture, etc. - use on boats to stabilize a bucket for odds and ends - bait, fish catches, tools, tackle, etc. - fun to flip in-side-out repeatedly for a form of therapy and amusement. - many other uses are being found by our users. you need this tool ! - controls the unpredictable spinning and movement of a 3.5 to 5 gallon plastic bucket when the contents are mixed or stirred. - anchors a 5 gallon paint bucket when roller painting from it to eliminate the bucket sliding or skidding across the floor when loading the paint roller. - protects finished surfacesfrom being scratched or damaged by preventing the bottom of the bucket from making contact with the surface and prevents the bucket from moving or sliding around when placed on a finished surface. BucketVise will be available on ebay and Amazon. BucketVise™ reduces the risk of injury when mixing and stirring. 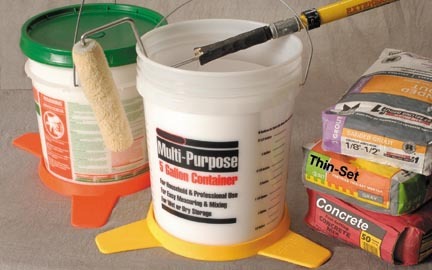 Protects finished surfaces from damage due to the bucket bottom moving around. Save one injury or prevent one scratch on a finished surface and its paid for! Unusual color makes BucketVise™ easy to locate. Not easily lost in the pile. Elastic material makes BucketVise™ fit most 3.5 to 5 gallon plastic buckets. Flexibility makes BucketVise™ easy to store. Just twist as needed to fit in storage spot. Virtually indestructible with normal use. Actually fun and soothing to handle and play with. One of those busy hands devices.